Milwaukee Gear may be old, but they keep their edge sharp by investing regularly in the latest technology. Plus, they’ve got some truly gifted machinists. Because of their versatility, as well as their ability to speed-up and automate the complex motion sequences, today’s automated computer-controlled machineries, intelligent robots, and majority of the modern automated equipment’s use highly dynamic servo-motors. On their AF100 AF101 and new AF110 CNC high speed gear hobbing machining centers, Affolter Technologies S.A. offers the option of -Skiving (micro Skiving). Composite bronze worm gear blank technology is a reliable, off-the-shelf cost savings solution that can be quickly evaluated and adopted. While often overlooked, workholding can play a vital role for customers interested in maximizing production performance. With a standard, full 5-axis multi-tasking machine, shops can cost-effectively process all of their larger, low-volume parts, including the occasional spiral bevel gear sets. The attraction of dressable CBN wheels over single layer CBN wheels, for gear grinding especially, is the ability to make profile corrections. The cooling rate and chemistry of a steel part dictates what type of transformation products form. By employing a hypoid gear, engineers have created a right-angle gearbox that offers high reduction, high efficiency, and compactness. 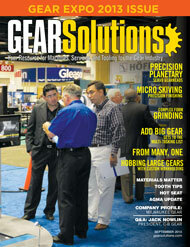 Methods Machine Tools to Represent Yasda Tools in U.S.